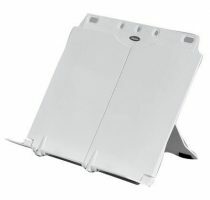 Holds multiple papers, open files or large books directly in front of the body. Need assistance? Contact one of our friendly consultants. 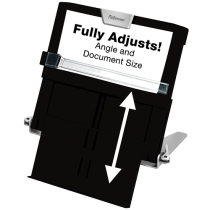 This almost invisible, strong, stable, in-line document holder holds multiple papers, open files or large books directly in front of the body. This position ensures safe, comfortable head, neck, back postures when using a computer and referring to papers. Eliminates potentially harmful twisting or leaning to one side to read papers on the desk beside the keyboard. Docslope is also a comfortable writing platform that can be used in this way while in position as a document holder, or slid over the keyboard and closer to the body for longer periods of reading/writing. 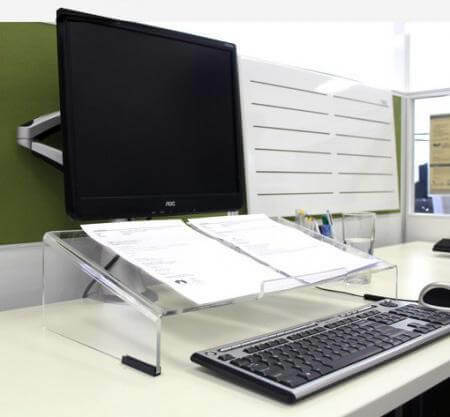 Document holder: Place DocSlope between keyboard and monitor and place reference papers on it. The monitor may need to be positioned a little further away. Reading/writing stand: Slide DocSlope forward over the keyboard to be an ergonomic reading, writing platform. At Back Centre, our product range is vast and quite unique. In fact we have the biggest range of office chairs in Australia. We provide a full suite of office desks, seating, equipment and accessories.